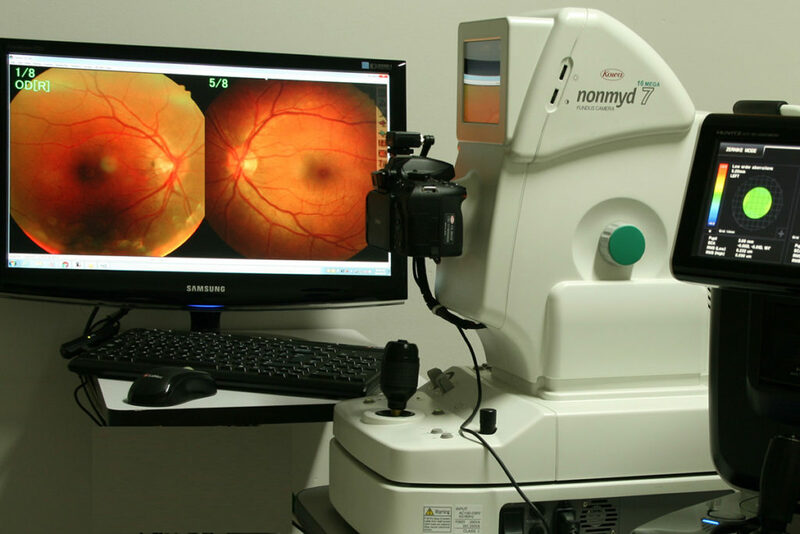 Retinal Photography, or Fundus photography, documents the retina, the neurosensory tissue in our eyes which translates the optical images we see into the electrical impulses our brain understands. The retina can be photographed directly as the pupil is used as both an entrance and exit for the fundus camera’s illuminating and imaging light rays. You will sit at the fundus camera with your chin in a chin rest and your forehead against the bar. An ophthalmic photographer focuses and aligns the fundus camera. A flash fires as the photographer presses the shutter release, creating a fundus photograph. Ophthalmologists use these retinal photographs to follow, diagnose, and treat eye diseases.